The Labour Day long weekend finally arrived, and the weather continued to be gorgeous. Although it was noticeably cooler each morning, the sun continued to shine bright and hot, and by the afternoon the temperature was reaching the mid-twenties. I wasn't able to spend much time outside on Saturday as my cat was due for his annual check-up at the vet's, but I did manage to fit in a couple of hours of birdwatching early in the morning. I went to Sarsaparilla Trail early on Saturday morning. The woods were still dark, and there were few birds around. I did feed a couple of chipmunks which came right up to me, then proceeded to the small boardwalk. Even the water was quiet; except for a couple of merlins flying around at the back of the swamp, I didn't see anything of interest. Still, I was in the mood for a walk in the woods and decided to go to the Jack Pine Trail next. I didn't have much time to spend at Jack Pine, and I wanted to check the back meadow for dragonflies, so I decided only to walk the outer loop trail. As the trail leads right past the northern-most boardwalk in the middle loop, I stopped to have a look. A few mallards were feeding on handouts, and a couple of Blue-winged Teals were feeding in their characteristic fashion: they don't tip up like mallards or Canada Geese, but rather feed with just their head either fully or partly submerged and their backs level with the water. I found a few more teals in the back pond with a couple of mallards and a single yellowlegs. There was also a smaller duck which kept to itself. 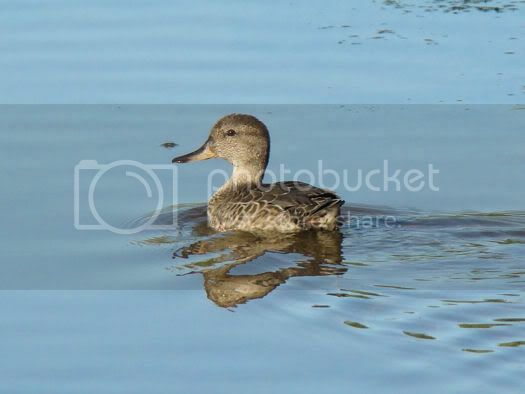 She was quite plain, but the shape of her head and the steep forehead, together with the colours of her bill identified her as a female Gadwall. As I had previously only seen this species from a distance, it was great to be so close to this bird and have such nice views of her. After leaving the ducks and the yellowlegs, I saw a hummingbird among the jewelweed, several Cedar Waxwings, and a Black-throated Green Warbler all in the same area at the back of the trail. From there I went to the meadow where I did find a couple of large mosaic darners flying above the fields. One of these darners chasing a smaller, pale dragonfly caught my attention. I thought the smaller one might be a Common Green Darner, but when it landed in the grass I could see that the eye colour was a beautiful dark brownish-red. I believe it was a Wandering Glider, but when I tried to edge closer, I either lost it among the grass or it flew off without me seeing it. That was it for my outing on Saturday, but I had plans to spend Sunday with Chris L. for a morning of birding and dragonflying. We decided to venture out to Shirley's Bay first to look for shorebirds and egrets. The egrets were absent, and the only shorebirds we found were two Solitary Sandpipers sitting on logs in the bay and a Spotted Sandpiper along the dyke. 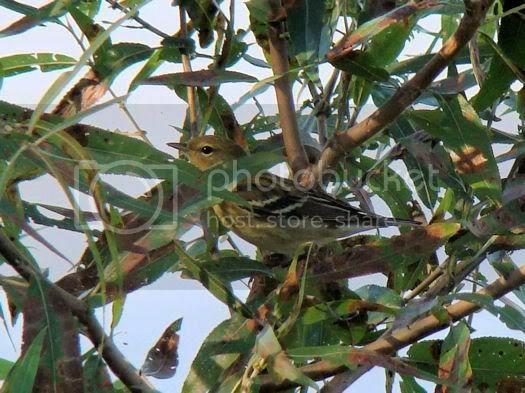 However, we did find a Palm Warbler and a Blackpoll Warbler in the trees along the dyke as well. 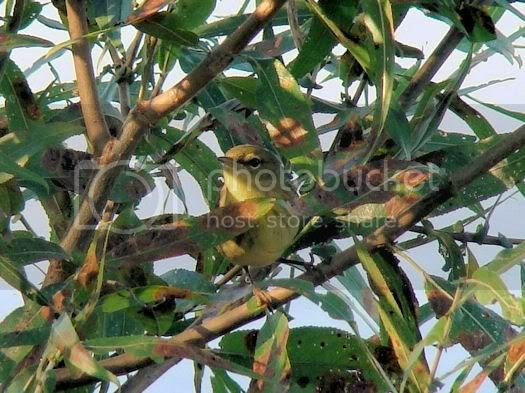 One of the confusing fall warblers, this species can be separated from the similar Bay-breasted Warbler by its faintly streaky chest and flanks and its flesh-coloured legs. Sometimes a hint of a dark cap can be seen as well. There were a few flocks of ducks in the bay as well. 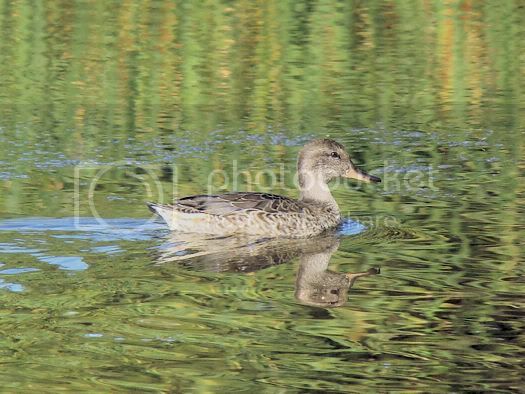 We saw some Wood Ducks, American Wigeons, a female scaup, some Blue-winged Teals and the usual mallards. Double-crested Cormorants flew by and were seen further out in the river, and both a Kingfisher and a Great Blue Heron were fishing in the bay. We didn't see many songbirds at all, and this may have been partly the result of the strong east winds that were blowing. As it was so windy, I was surprised when a bright orange butterfly flew by, likely startled from wherever it was sheltering as we walked by. 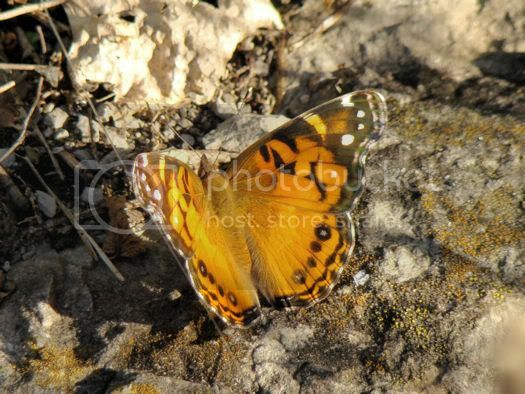 Fortunately the butterfly landed on a rocky spot in a nice patch of sunlight, and Chris was able to identify it as a Lady. 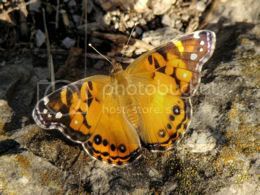 However, the butterfly refused to show us the underside of her wings, which is the best feature for distinguishing American and Painted Ladies. I took several photos of her top side, but would have to wait until I got home to identify it as an American Lady - a lifer for me. Other insects seen along the dyke included a couple of large darners, including a single Common Green Darner, and several Eastern Forktails. We didn't stay long as there wasn't much activity and returned to the shore without seeing much else along the way. 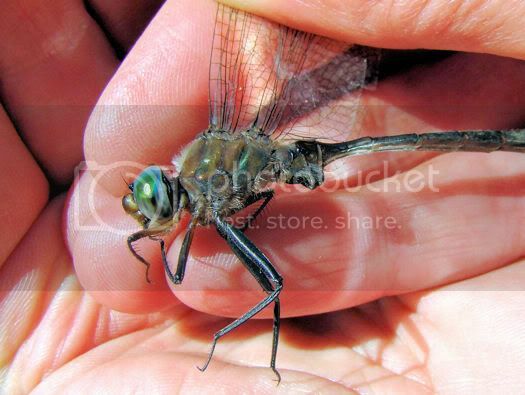 There we found a single spreadwing damselfly but we weren't able to identify her. Like some birds, male odonates are usually easier to identify than the females. From there we drove over to the Bill Mason Center. This proved to be an excellent decision as the winds were calmer inland, and there were meadowhawks and mosaic darners everywhere! Although we didn't see any noteworthy birds along the boardwalk, the number of dragonflies more than made up for their lack. They were even more abundant at the open sandy area at the back of the trail, where we saw a couple of meadowhawk species, Canada and Lance-tipped Darners, and a couple of bluet species! 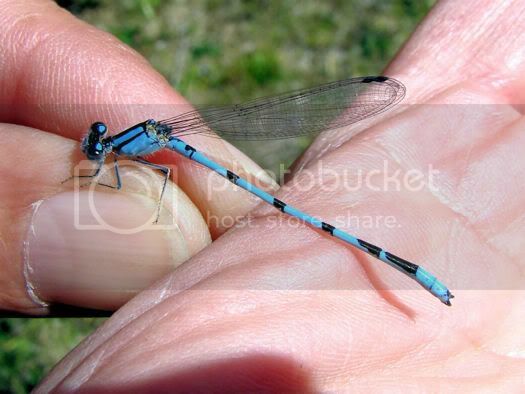 These small black and blue damselflies have become more and more difficult to find as the summer draws to a close, but Chris netted two different species. The first was a Familiar Bluet, which is a rich, gorgeous shade of blue that is deeper than the blue of the more abundant Marsh and Hagen's Bluets. 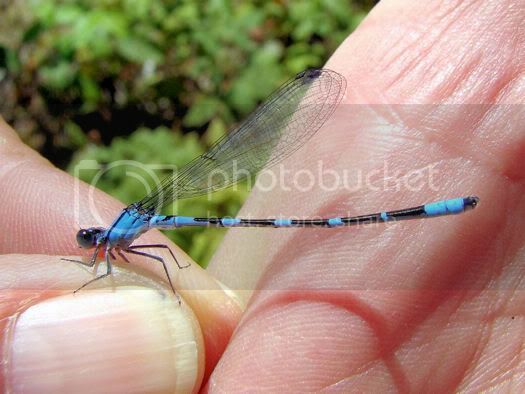 The second bluet was the Tule Bluet, a lifer for me. 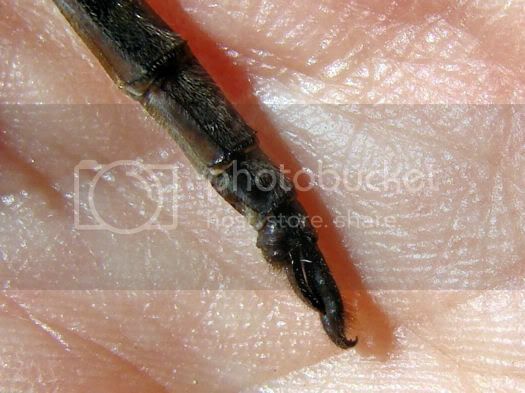 Chris identified it by examining the shape of the claspers under her hand lens. 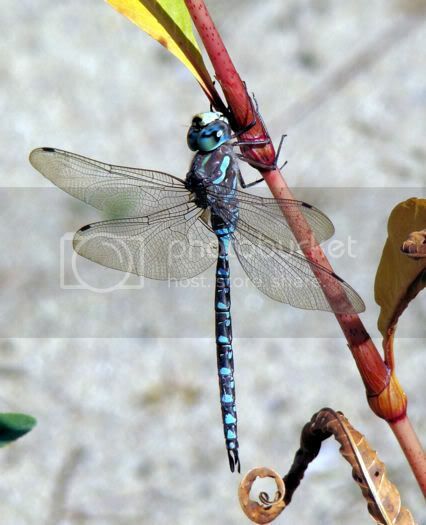 Canada and Lance-tipped Darners were abundant, and we saw several mating wheels and many others perching on tree trunks and in the vegetation. Then Chris pointed out an emerald perching on a mullein plant. She said right away that this was an interesting dragon, and that it wasn't one of the common species found in Ottawa. I took a few pictures of it perching before she swept her net down and caught it for closer examination. As with all adult emeralds, its eyes were bright green. This individual also had faint, indistinct yellow markings on its thorax, which is bronze and green in colour. These yellow markings are bright in young Williamson's Emeralds and darken with age. Young individuals also have yellowish-orange markings on segments S2 and S3 of the abdomen (the two thick segments near the base) which likewise darken and become obscure with age. No examination is complete without a look at the claspers at the tip of the abdomen. The Williamson's Emerald is one of the species that has "ski-shaped" upper claspers. (In fact, there is even a species called Ski-tipped Emerald!) In profile, the tips of the claspers curve upwards more than those of similar species, giving them the appearance of elf's shoes. They are also somewhat hairy as seen in the photo below. 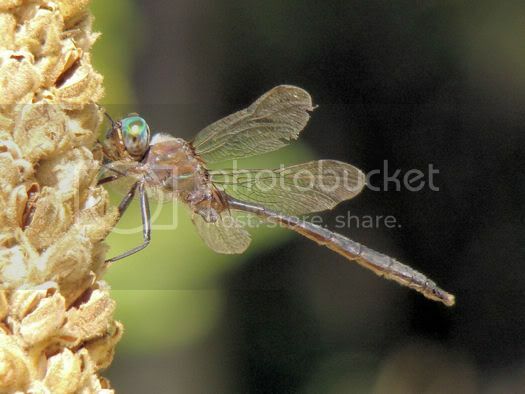 This dragonfly was a great find and a lifer for me as well. Although my field guide says it is one of the most frequently encountered members of its genus in Algonquin Park, it is nevertheless still uncommon where it occurs in the rest of Ontario, including Ottawa. The recently updated Ottawa checklist concurs, describing it as an uncommon and local species. The checklist also indicates that it has a flight season lasting from early June to mid-August, which makes this sighting especially interesting! It was a great weekend to be out, with beautiful weather and many great species of all kinds. Fall migration is well underway, and it's a beautiful time of year to go and see what's out there!